Cryptocurrencies are here to stay, that’s for sure! Here is our detailed guide on how to trade bitcoin, the world’s most prominent cryptocurrency. Follow this guide for information and tips regarding bitcoin trading principles and techniques, profit and loss calculation, bitcoin correlation, and major events that could impact your profits when trading bitcoin! Start your bitcoin trading journey today. What is Bitcoin (BTC, XBT) and How Does it Work? In January 2009, the financial world changed forever when the ‘genesis block’ of bitcoins was mined by an anonymous person (or persons) using the pseudonym Satoshi Nakamoto. That was it, the first decentralised cryptocurrency was created. Bitcoin is created by computers performing painstaking mathematical computations and thereby converting electricity into long strings of code that have monetary value. This computing is done in a distributed network and is called bitcoin mining. Bitcoins can be transferred between individuals’ cryprocurrency wallets or used to purchase goods or services online. Every transaction done with bitcoin is recorded in a massive data ledger called a blockchain. This blockchain technology upon which the whole bitcoin system is based combines the resources of all the machines that mine bitcoins and process transactions on the network. This decentralised collaborated effort ensures that no central authority can completely control bitcoin. Bitcoin (BTC, XBT) is the cryptocurrency with the largest market capitalization. At one stage, in 2017, its market cap was more than 37.5 billion dollars. There can be no more than 21 million bitcoins. The reason for this supply limit is the decreasing-supply algorithm that is used in the mining process. The bitcoin mining process becomes exponentially slower as it progresses and it is estimated that the last bitcoin will only be mined in May 2140. Bitcoin (BTC, XBT) contracts for difference (CFDs) can be traded on the eToro trading platform. 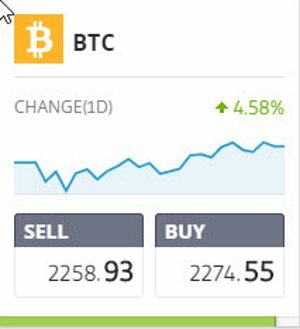 eToro offers unleveraged trading on bitcoin (and other cryptocurrencies) which doesn’t incur any commission or rollover charges. Of course, there are other brokers that offer leverage on bitcoin trading. Because of the volatility of bitcoin, it isn’t wise to trade it with much leverage. Unleveraged trading is the safest way to trade bitcoin, of course. Also, bitcoin’s immense volatility may, in certain instances, require the use of wider stop losses than which are normally used when trading instruments like currency pairs, for example. When trading bitcoin, traders can generally apply the same trading principles and techniques used for trading traditional financial instruments like forex currency pairs or stocks. 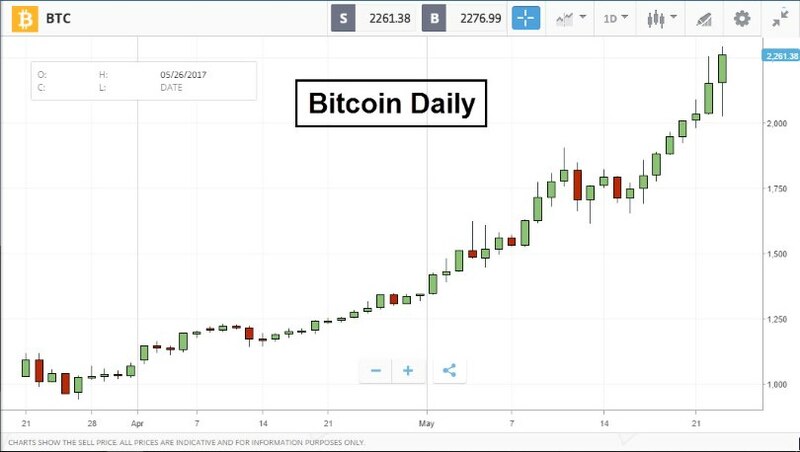 Buy and hold strategies have yielded phenomenal results with bitcoin trading. For example, many investors who have used ‘buy and hold’ strategies have achieved good results therewith. There have also been numerous swing trading and breakout trading opportunities on this incredible digital currency. Calculating profits and losses on bitcoin trading is quite simple, especially if the trading account’s base currency is U.S. dollar. Here the spread is $2274.55 minus $2258.93 = $15.62. This is quite expensive compared to spreads on major currency pairs, but remember, this is not a currency pair. The price of bitcoin moves much faster than any currency pair and is also much less liquid than especially the major currency pairs. The entry price (open price) was $1839.89. The take profit order was filled at $2173.27. That is a profit of $333.38 per bitcoin. As seen in this screenshot, the invested amount was $250, which was 0.1358776 bitcoin at that stage. There is a slight difference between this amount (0.1358776 bitcoin) and the actual position size (0.135491 bitcoin). There is no logical explanation for this but perhaps there was slippage which affected the executing algorithm’s calculation. The actual profit of $45.17 is derived by multiplying the actual position size of 0.135491 bitcoin by the profit of $333.38 per bitcoin: 0.135491 X $333.38 = $45.17 profit. It should be kept in mind that the position size displayed in eToro’s terminal is a rounded number, hence the position size of 0.135491 is displayed as 0.14 in this instance. Other prominent cryptocurrencies like ether (ETH) and litecoin (LTC) are positively correlated to bitcoin. This correlation, however, has varied from time to time. *For traders who’d like to learn more about trading ethereum, here is a link to an article dedicated specifically to this phenomenal cryptocurrency: How to Trade Ether (Ethereum) – Beginner’s Guide. There have been times when ether (ETH) and litecoin (LTC) have moved in opposite directions to bitcoin. Nevertheless, these two cryptocurrencies are prone to move in tandem with their big brother bitcoin, because bitcoin generally sets the tone for the cryptocurrency market. When bitcoin performs well, it sends out a message to the investment community that all is well in the cryptocurrency market. Consequently, ether and litecoin tend to benefit from a rosier bitcoin. Ether and litecoin are some of largest cryptocurrencies. Conversely, a bitcoin crash is likely to weigh on litecoin and ether, depending on what caused the crash, of course. Sometimes other cryptocurrencies can benefit from a weaker bitcoin. This is usually the exception to the rule, though. Although bitcoin is the most established cryptocurrency, it is still very young compared to fiat currencies like the U.S. dollar and the British pound. Because of this, events related to its development and operation have the potential to move its price drastically. Such events could include ‘hard forks’ which alter the internal structure of how bitcoin operates. Bitcoin faces an evolving scaling issue which needs to be addressed in one way or another. Increasing the bitcoin block size capacity is one way to solve the serious blockchain congestion problem faced by the bitcoin community at the moment. In order to accomplish this, a ‘hard fork’ is unavoidable, though. Something else that could affect the price of bitcoin considerably, is a global financial crisis. If confidence in major central banks and governments fails, there could be a flight to safety which could boost the appeal of alternative stores of value, of which bitcoin could be an important one. On 5 December 2013, the People’s Bank of China stepped in and banned financial institutions on the Chinese mainland from dealing in bitcoin. This intervention by the Chinese government caused a massive selloff, and bitcoin lost more than 50% of its value in a matter of days. After this initial plunge, the bitcoin price continued drifting lower for more than a year before it bottomed out. Is this the type of breakthrough you need in your trading career? Visit our signals page today and try out our free or premium trading signals!